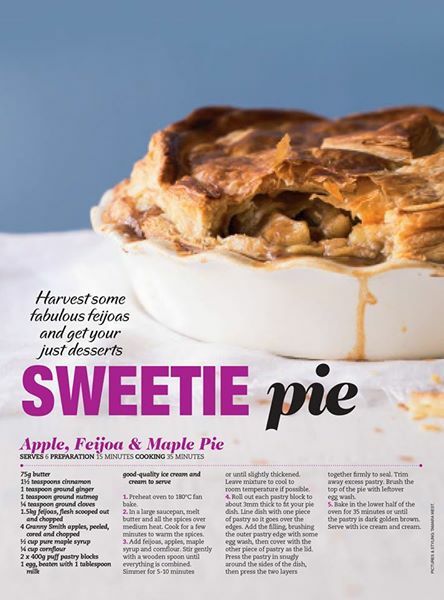 Chelsea Winter is a popular food columnist in New Zealand’s Woman’s Day magazine. She recently appeared on TV1’s Good Morning show with this spiced maple-sweetened pie that has winter comfort written all over it. If you missed the mag, the recipe features on the Good Morning website. Search for feijoa to discover other wonderful recipes. Preheat oven to 180°C fan bake. In a large saucepan, melt butter and all the spices over medium heat. Cook for a few minutes to warm the spices. Add feijoas, apples, maple syrup and cornflour. Stir gently with a wooden spoon until everything is combined. Simmer for 5-10 minutes or until slightly thickened. Leave mixture to cool to room temperature if possible. Roll out each pastry block to about 3mm thick to fit your pie dish. Line dish with one piece of pastry so it goes over the edges. Add the filling, brushing the outer pastry edge with some egg wash, then cover with the other piece of pastry as the lid. Press the pastry in snugly around the sides of the dish, then press the two layers together firmly to seal. Trim away excess pastry. Brush the top of the pie with leftover egg wash.
Bake in the lower half of the oven for 35 minutes or until the pastry is dark golden brown. Serve with ice cream and cream. *Or, if you’re like me, you can go with those pre-rolled puff pastry sheets. Phil, you have a feijoa festival! In a part of the world I would love to visit… love your art and your blog and your lifestyle. Thanks for letting me find you. Putting my frozen feijoas to good use!